Dover Athletic 2 Cambridge United 4, 17/11/2016. The Crabble, FA Cup first round replay. 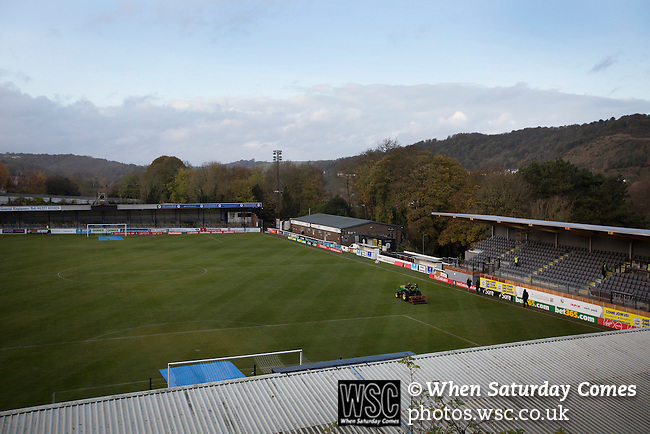 A groundsman mowing the pitch at the Crabble, pictured before National League Dover Athletic hosted League 2 Cambridge United in an FA Cup first round replay. The club was founded in 1983 after the dissolution of the town's previous club Dover FC, whose place in the Southern League was taken by the new club. Cambridge United won the tie by 4-2 after extra time, watched by a crowd of 1158. Photo by Colin McPherson.